Be the first to share your favorite memory, photo or story of Rudy. This memorial page is dedicated for family, friends and future generations to celebrate the life of their loved one. Rudolph K. “Rudy” Kraut, 95, lifelong resident of Pecatonica passed away peacefully at home Thursday, November 22, 2018 with his family by his side. Born on September 25, 1923 in Freeport Illinois, son of Ferdinand and Louise (Pospischil) Kraut. He graduated from Pecatonica High School in 1942 and joined the Navy on his birthday in 1943. He proudly served his country as a submarine Torpedoman 2/C in WWII aboard the USS Lizardfish in the Asiatic-Pacific Theater. Rudy married Caroline (Meyer) Kraut on July 3, 1948 in St. Mary Catholic Church in Pecatonica where he had been a member for almost 80 years. Rudy was a successful building contractor for over 60 years in the local area. After his retirement he continued to do handyman work for almost everyone who asked him. 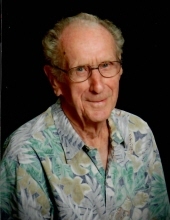 He was an avid outdoorsman – golfing, gardening, trapping and fishing. For over 40+ years, he lived for his annual fishing trip to Lake of the Woods, Canada. He was proud to have gone on the Peoria Honor Flight with his son, Mark in 2015. He loved to attend SubFest in Manitowoc, where in July he was inducted into the prestigious Holland Club on the deck of the USS Cobia by Tom Ramsey, Commander of the USS Illinois Base, USSVI. He remained active until the end; voting in the last election, mowing his own yard, enjoying morning coffee at the Stonewall Cafe “Table of Knowledge”, attending the Veteran’s Day Celebration at the High School, monthly luncheons with Archie Holte and Jim Moorehead, two other WWII submarine veterans, Friday night fish fry at Bootie’s and Saturday evening mass. He was a devoted husband, father and grandfather. Rudy is survived by daughter Julie (Terry) Carius of Houston; son Mark (Becky) of Metamora; grandson Andrew (Jinny) Kraut of San Mateo, CA; granddaughter Ann Kraut of Peoria, sister-in-law Blanche Kraut of Pecatonica and many nieces and nephews. He was predeceased by his wife Caroline, and nine brothers and sisters. The family would like to thank In Home Personal Services, especially Olayinka “Ola”Odubela and OSF Palliative and Hospice Care, especially Amy Kroos for their skilled services, care and support. Prayers will be held at 10:00 a.m., Saturday, December 1, 2018 in McCorkle Funeral Home – Pecatonica Chapel, 203 West 5th St with a Funeral Mass at 10:30 a.m. in St Mary Catholic Church, 126 West 5th Street, Pecatonica, IL with Reverend Joseph Jaskierny and Reverend David Beauvais con-celebrating. Burial will be in St Mary Catholic Cemetery, Pecatonica, IL. A visitation will be held at the funeral home from 4:00 to 7:00 p.m., Friday, November 30 with a scripture service at 7pm. In lieu of flowers, memorials to St. Mary Catholic Church, Pecatonica Community Food Pantry, the Rockford Rescue Mission or a charity of your choice. To send flowers or a remembrance gift to the family of Rudy K. Kraut, please visit our Tribute Store. "Email Address" would like to share the life celebration of Rudy K. Kraut. Click on the "link" to go to share a favorite memory or leave a condolence message for the family.